Did the story refract any element of the art that made you see the your piece differently? Artist Anya Ermak-Bower: Yes, absolutely. Anna’s response startled me: I couldn’t believe the way her writing precisely conveys my overall spiritual and emotional state at the time I started the piece. When I first read it, I thought, “Wait—what does this have to do with the the illustration? Do the two pieces have a conversation or are there two running monologues here?” A few moments later it clicked. It all made perfect sense. In what sense did the art first present itself as a collaboration with a written piece? Did it come to you first as image? As an idea? Music? Narrative? Writer Anna Mueller: The art presented itself as an emotion—a combination of effort, frustration, and loneliness. I wanted to create a similar emotion through scene. If the broadside collaboration were a land formation, what would it be? Writer Anna Mueller: A mountain. What did you think a writer would pick up on from your art? Artist Anya Ermak-Bower: A couple different situations crossed my mind as the picture took shape: It could symbolize the work of a relationship, achieving a goal, or even address politics on some level…So I kept my mind ( and ears) open to see what would happen with it. And the response was great! What surprised you about this experience? Artist Anya Ermak-Bower: How deep words can travel. Let’s say that your broadside collaboration was a first date. How did it go? First base? Second? Nightcap? Would you make plans for a second date? Artist Anya Ermak-Bower: It seemed to turn out very nice. Those two strike me as a couple that can finish each other sentences. It’s a great idea not only to have outstanding poems illustarted, but to see an illustration gaining a voice has been an extraordinary experience. Every artist should have a chance to see their work speaking—whether it’s whispering or screaming. Writer Anna Mueller: The best first date of my life, but maybe that’s because I’m horrible at first dates. I would nervously make plans for a second date, hoping it would be just as satisfying as the first. Artist Anya Ermak-Bower: Murakami’s Kafka On the Beach was addictive. He definitely has a voice all his own. Writer Anna Mueller: I’m slowly making my way through Sei Shonagon’s Pillow Book, and have been re-reading a lot of Robert Frost. I’m also kind of obsessed with the comic book series Y: The Last Man by Brian Vaughan. Seen any good art exhibits lately? Artist Anya Ermak-Bower: Funny you should ask. The last good exhibit I saw was a collaboration of Fairbanks artist Margo Klass and writer Frank Soos’ Mixed Media and Miniature Prose. The reception to Broadsided’s first Switcheroo was wonderful, with many poets and prose writers sending their submissions and responses. Each entry offered its own joys; each poem or story chose a slightly different platform to leap from. In the end, Anna Mueller’s “Dishes” surprised and delighted us, capturing the deep feeling of Anya Ermak-Bower’s art in a completely unexpected way. Timing is a funny thing. Today, the day before this Broadsided Switcheroo was to go live, we opened the March/April issue of The Writer’s Chronicle to see an article by Lauren Rusk titled “The Possibilities and Perils of Writing Poems about Visual Art.” In it, she talks about poems that successfully leap from visual art into a conversation all their own, leaping toward verse that enlarges rather than recapitulates its inspiration. For us, The Switcheroo was a fascinating glimpse into the convergence of visual and literary art. 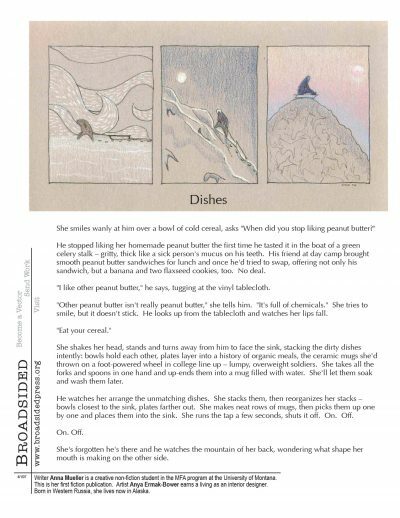 What does a triptych of a lone sledder on a harsh mountain have to do with a mother washing dishes? We hope you’ll feel the truth of the relationship when you download the broadside. As with every Broadsided publication, you can read what the artist and author thought of the whole process in our Collaborators’ Q&A. Our thanks to out to all writers who sent in their creative responses, and we hope to do more Switcheroos in the future. Note: “Dishes” is the first Broadsided Switcheroo feature. What is The Switcheroo? All Broadsided artists were invited to submit up to three pieces of work. We then asked an outside judge, Lynn Stanley, to review the submissions, choosing one that she thought would be open to literary response and would work in the Broadsided format. She chose the image below, “Whatever it Takes to See the Sunrise” (colored pencil and ink on tinted paper; 8″ x 10″), by artist Anya Ermak-Bower. The primary goal was to choose work that would engage poets and become a broadside. In terms of personal aesthetics my first inclination was towards the less representational pieces and a number of submitted works contained emotional ambiguities that could serve as interesting points of departure. In the process of making a final choice, however, I realized that I’ve become interested in when and how I resist works of art—and then to examine that position. My initial response to the drawing series was to dismiss it—the drawings have a slightly cartoonish quality and the narrative elements are obvious. As I revisited the work I came to appreciate what I identify as a combination of wistfulness and earnestness. The series—its color palette and flat, simplified forms—reminds me of Japanese woodblock prints. I became attracted to what I’d characterize as emotional transparency or the “heart” of the work. I’m particularly drawn to the image on the far left and the feeling of pushing through. Thank-you for the opportunity to participate in a visual-verbal dialogue and to all the artists who submitted work. Artist Anya Ermak-Bower earned her design degree from a university in Western Russia. She has lived in Alaska for five years, and channels her creativity into work, cooking, and raising her sons. She is now living in Japan with her family. Image: “Whatever it Takes to See the Sunrise,” 2006, colored pencil and ink on tinted paper, 8″ x 10″. Writer Anna Mueller is a creative non-fiction student in the MFA program at the University of Montana. This is her first fiction publication.